Last weekend, I decided to do something I’d never done before: I saw a movie all by myself. Now, I know that may seem like something really small (I mean, movies are basically just sitting in silence in a dark room – which seems like the perfect solo activity) but this was something I’d always been nervous to do. However, with the release of Jordan Peele’s Us, I really wanted to see it before someone had a chance to slip me some spoilers, so I went out to see it right away! A lot of people are very excited about Us because of Peele’s directorial debut Get Out (2017). While Get Out was a nearly flawless movie filled with great metaphors about race in America, Us is perhaps too ambitious. While I definitely enjoyed Us, it was much messier from a craft perspective than Get Out. I was entertained as we followed this family, and I loved that this was more of a traditional horror story than Get Out (which some critics still refuse to acknowledge was also horror). Still, there were things that made me feel a bit disappointed in the film overall. Here are my pros and cons for this movie! 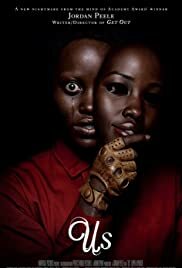 Superb acting from many characters, especially Lupita Nyong’o (even when the dialogue wasn’t doing justice to the acting). While the plot had many classic horror tropes, it managed to feel like a very fresh take on the genre. The tension continually increased throughout the movie and there were many twists and turns that kept the plot from slowing down in the middle. There were a few moments of dark humor that definitely added to the experience. Some of the symbolism and metaphors were REALLY heavy-handed. Whereas the symbolism and metaphors in Get Out served the larger plot and added an element of social commentary that greatly enhanced the movie, the symbolism and metaphors in Us seemed to be the sole driving force with the plot acting in service to the theme of the movie. Other metaphors and symbols of the movie weren’t clear enough, which seemed to take a lot of people out of the movie (based on my experience, the experience of several people I know, and the general eavesdropping I did after the movie). The “twist” at the end added confusion and radically changed how the movie is viewed. While there were elements I liked about the twist (which I don’t want to give away in case you haven’t yet seen the movie), it seemed gimmicky to me. It didn’t make the overall film stronger (the metaphorical parallel drawn between the characters was already clear), but it did leave many scratching their heads and wondering how to literally interpret and explain the feasibility of what they just watched. Overall, I’m really glad that I watched Us. I think my expectations might have been a bit too high based on how much I loved Get Out, but I’ll absolutely watch whatever Jordan Peele’s next horror movie ends up being…and I’m very excited for his reboot of The Twilight Zone which debuts Monday 4/1. Have you seen this movie yet? If so, I’d love to hear your thoughts in the comment section.